Inline Hockey Association (WIHA) Finals at the Irvine Inline Arena. The Micah Sanford-coached Rebels went 5-1-0 here this weekend. Irvine, California – Eric Atchinson had two goals, one assist and Ashley Printzen had two goals, one assist as the Las Vegas Tour Rebels Mite A 10u team beat the San Diego Stingrays 4-1 today in a Final 4 game in the Western Inline Hockey Association (WIHA) Finals here at the three-sheet Rinks Inline Arena. Las Vegas will now take on Reebok Jr Ducks today in the gold medal game. That was Brendan Harris of Arena blasting around the rink in the Great Western Futures Showcase this past week at the SoBe Ice Arena inside of the Fiesta Station Hotel-Casino on North Rancho Drive, Las Vegas. “He is really is a special kind of player – quick, great puck skills, the way he manuvers around the ice. There were a lot of scouts talking about him,” said Rob Pallin, the Las Vegas Hall of Fame hockey coach. Harris, who played last winter in the AAA California Titans midget program, has a verbal commitment when he graduates from high school to play for St. Cloud University. Pallin said super-skilled Joey Sullivan, who was at Great Western Futures, is “an elite player in all phases of his game. He had a great skate during the week.” Sullivan, from Las Vegas, will play for USHL Indiana Ice this season. Eric Williams, a big defenseman from Las Vegas, also played well and drew a lot of attention….There were two top Las Vegas goalies in the showcase – Chase Smith and T.J. Yocum. Chase last season played for Mission Arizona AA 16u. He plans to head next to the AAA Colorado Thunderbirds midget tryout camp next month. T.J., 15, is going into his sophomore year of high school. He plans to play for the AA Las Vegas Jr Wranglers 16u this fall. //Las Vegas skaters Cory Ward, playing for Bemidji State, and Chris Francis, with the Las Vegas Wranglers, are on the ice for some hard skating drills with Pallin at the SoBe Ice Arena. //Years ago, Will Munson played for AAA San Diego Jr Gulls 18u, then was a top player for the NAHL Billings Jr Bulls in Montana. Munson has played in quite a few NARCh National Roller Championships as well. 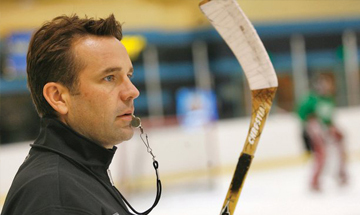 BLUE LINE NOTEBOOK — AAA Las Vegas Outlaws midget majors will have a mini-camp the second weekend of August at the Santa Fe Stations Ice Arena on Rancho Drive…..Games will be scheduled and there are new skaters ice coach Rob Pallin will be looking at……AAA Outlaws still have several spots available on the roster…. We were on the Cheetah team bench during the weekend and there was lots of great sumertime hockey talk during all of the Six Pac tournament games…..it’s a thrill for Micah, who is away from home 10 months a year, to reassemble his roller team which won national titles in 1996…. John Horton, the ice rink manager at Crystal Palace on Flamingo, says he’ll have a grand opening right around the first weekend of September……He’s ambitious and says his house league games should attract many skaters….Plus, he pours a great cup of coffee…..John worked the counter at the snack bar at the Six Pac Nationals roller tournament…. Good luck to Eddie Del Grosso. He heads for the famous ‘Hockey Night in Boston’ tournament which begins August 3…. The dynamic Jeff Hajner of Las Vegas was the captain of his junior team, the Melfort Mustangs in the Saskatchewan League and a captain with the Frank Serratore-coached Air Force Academy. Hajner set an Air Force record playing in 150 consecutive games. He was the first Las Vegas skater to score in a NCAA Tournament game. Now 27, Hajner is living in Houston, Texas. “I am working for an oil company in Houston,” Hajner wrote in a text. “There is a large Canadian presence here due to the oil industry. I play hockey once in a while but miss the frequency I played while living in Boston last year. There are a lot of former college guys playing in the competitive leagues but hockey in Texas isn’t quite the same. Hajner said his best-game ever was an easy one to select. Air Force, in March, 2009, took on #1-seed Michigan in a first-round NCAAA Tournament game at the Bridgeport Arena in Connecticut. “That was my favorite game,” Hajner said. “We beat Michigan 2-0 in the NCAA game and I got the assist on the game-winning goal. I will never forget it.